This petition has been created by Pema and may not represent the views of the Avaaz community. 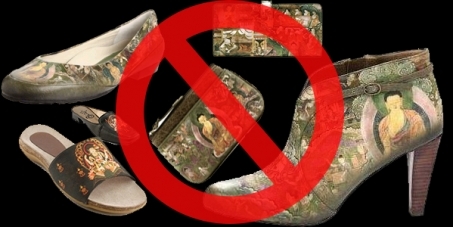 The International Buddhist Community is deeply disheartened to see Buddha's images on Shoes and Handbags. This is a disrespect for whole Buddhist community and the concerned Businesses have no sense of respect and consideration for other beliefs and religion. This is a great disgrace for entire Buddhist community who are trying hard to preserve and promote their religion. Buddhism is our religion like any other beliefs. What is Jesus to Christian and Allah to Muslims, Buddha is to us, the Buddhists. We are sure no one would like to see one's religion icons on foot-wears and apparels.